Orlando Florida Golf Courses number well over 80 plus. They are very diverse with all of the top architects and course designers having at least one Orlando area golf course. Below is a list of course partners for Orlando Florida Golf Packages. The courses are centrally located and near some of the areas most popular lodging options including condo’s and resorts. In their final collaboration, Robert Trent Jones Sr. and Jr. developed a beautiful, lush and playable golf course for all skill types. The course features pristine conditions from tee to green. There are a few hazards but with ample room off the tee, they should be easily avoided. This European Scottish Style layout awarded 4.5 stars by Golf Digest features Scottish style bunkering, impressive bulkheads bordering many water hazards and green complexes. Excellent playing conditions and Mini Verde greens that provide a fast and smooth putting surface are the reason Eagle Creek was recently ranked among Orlando’s best. This private signature Jack Nicklaus design sits next to the Butler Chain of Lakes and uses the diverse region to give golfers the best possible experience. From tee to green, the course is one of the best maintained and conditioned courses in the region. There is ample room off the tee but like most Nicklaus courses, the difficulty is the approach shot. Designed by 1973 US Open Champion and golf commentator Johnny Miller, Harmony Golf Preserve is carved from beautiful pine forests and I surrounded by wetlands filled with native wildlife. Located about 45 minutes form downtown Orlando Harmony can accommodate players of all skill levels five sets of tee boxes from 5400 to 7,400 yards. Award winning Hunter’s Creek once honored as a “Top 75 Public Place to Play” in the country. Set among 13 lakes and rolling fairways Hunter’s Creek provides a great natural setting that all golfers are sure to enjoy. Hunter’s Creek is located just minutes from Downtown Disney and the Orlando Airport. This 36-hole facility has something for the entire family. The Kings Course is a par 72 spread across a gorgeous countryside landscape. Your entire bag will be tested throughout the round as well as hitting an accurate tee shot. The Ridge Course is an executive course that plays to a par 57. Ron Garl designed this short course to give those just starting out a place to learn the game. The course has turned into a place where everyone can work on their game. Located near the regional airport, this layout has an abundance of wildlife throughout the property. The course features small greens and a short total yardage but allows the golfer to work on his wedge game. Any type of golfer can come out and enjoy a very playable course. Located on the shores of Lake Louisa, this Lloyd Clifton design has been carved out of former citrus groves. There is a surprising amount of elevation changes throughout the course and a rare thing to see in this area. The course does have some large, undulating greens that will definitely test even the seasoned golfer. Opening in 1922, this classic design is one of the oldest in the area. The course has tight fairways, small greens that are protected by a guarding tree and very few hazards. The course asks for premium driving and a solid wedge game. Playing smart on this course will never hurt you. Originally built in 1986 on an Orange Grove, this Robert Trent Jones Sr. design was recently renovated and was promptly voted best golf course in Orlando by Orlando Magazine subscribers. Metro West’s notable characteristics include spring fed lakes surrounded and large fairways with significant elevation changes that provide views of the Orlando Skyline. Rated 4 ½ starts by golf digests Mystic Dunes is considered one of Florida’s most unique courses. 80 foot elevation changed mixed with pot bunkers bordered by native marsh areas and large Oaks give Mystic Dunes a distinctly different feel than other Orlando area golf courses. Stay onsite at in spacious multi room condos at Mystic Dunes Resort. Home to two of Florida’s best courses, this is a must play if you are in town. 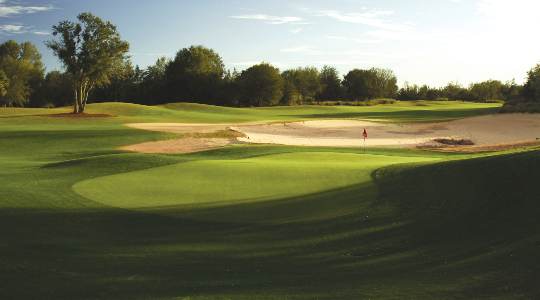 Located on an old citrus farm, Panther Lake and Crooked Cat provide all golfers a wonderful golfing experience. Formerly the home of the first stages of PGA Tour Q-School, the club boasts a stellar practice facility and even a 9-hole par three course called the Teeth. Even if your round wasn’t the best, there are plenty of places to work on your game. Orange Lake Resort’s Legends Course is a 6,600 Yard Arnold Palmer design. The open fairways and contoured greens on the front nine, known as the links, provide a Scottish links style experience. The back nine with its towering pines and meandering creeks is more reminiscent or a course you may find in the Sandhill’s of North Carolina. The 6,500 yards Orange Lake Reserve course is bordered by preserved wetlands and provides scenic views of native wildlife and plants. Don’t let the length fool you well placed bunkers, numerous water hazards and tree lined fairways make sure quality shots are required in order to post a good score. Renowned course architect in the area, Dave Harmon used the 480 acre property to perfection. The course is spread out over sand dunes, small ponds, thick woods and waste areas. There are a lot of split fairways off the tee and on the par fives which makes your course management the most important club in your bag. Ridgewood Lakes Golf Club is a fair and forthright golf course and great choice for traveling golfers. Spacious fairways provide plenty of room for golf swings with a little winter rust. But attention is required; numerous water hazards will make big misses costly. Champion Bermuda greens provide smooth and consistent putting surfaces. One of the older courses in the Orlando area, this track was host to the Citrus Open on the PGA Tour schedule back in the 70’s and 80’s. The course boasts tight, tree-lined fairways and well-bunkered greens. There are a few meandering creeks and canals that can come as a surprise but for the most part the course is right in front of you. Home to two golf courses, the Lloyd Clifton and Ron Garl design features over three thousand acres of beautiful woodlands, marshes and wetlands. The Oaks course is the full championship course that requires good tee shots and a solid short game. The greens are on the small side but are not difficult to putt. The Cypress Course is the executive course and it is a great place for all-skill levels to develop their games. If you are looking for the best green s in town, this is the place to go. Arthur Hills designed a wonderful layout that puts a premium on accuracy and length. The course has plenty of water but most of it is visually intimidating and doesn’t come into play. The greens are large and have smooth sloping but the Champions Bermuda is some of the finest in the area.